Beautiful Creatures for me was a fascinating read, but I got tiresome of Ethan’s inner monologue. I know lots of fans love him, but I think he is just an okay protagonist. I like guy POV’s, but I honestly couldn’t bare being inside Ethan’s head for more than two hours. It got even worse when I read the second book which I didn’t even finish. 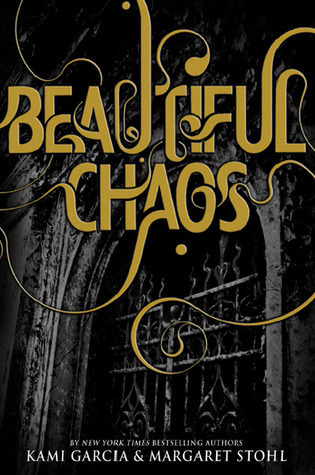 So how in the world did I end up reading Beautiful Chaos? Don’t ask me, because I can’t answer to your question. All I know is I wanted to know how the story continues (I finished reading Beautiful Darkness via my dear, dear friend Wikipedia) and I wanted to try listening to an audiobook so I decided to give this series one more try. I do not regret it! Beautiful Chaos is literally chaotic. Sometimes authors name their books trying to stay true to this series of name combinations, but Garcia and Stohl have done an outstanding job with Little Brown when it comes to naming these four novels. In addition to being chaotic, it was darker, more twisted, emotional and action-packed. I even got tears in my eyes in one scene with Link and Ridley, but no tears from me while reading the first two. The narrator in this audiobook did a pretty decent job especially with Amma and aunt Mercy. I didn’t imagine Link (love that kid!!) with that kind of a voice, but it was pretty okay too. I can’t tell you much about the plot, because if you haven’t read the second one, you will be disappointed by the spoilers, so let’s just say that you can expect lots of Abraham, Seraphine, an unexpected romance between two people on the opposite sides (which I was totally happy about) and lots and lots of sneaking around. You don’t know until the very end who will be the one to sacrifice oneself, who is bad, who is good and overall your thoughts will most likely be the kind of “What the heck is going on? ?”.The first half of the book wasn't that exciting, but when the real action began, it didn't stop until the last sentence. Which brings me to the cliffhanger. There was a cliffhanger and when I heard the last few words I was like “What? It ends just like that? No, it was just getting really interesting.. -.- “ I guess they need to leave something for the final book which I’m more than eager to read now. I’ve actually grown to like all of these characters in their own way and I’m anxious to see the movie of the first book which comes out in February, 2013. I think this world Garcia and Stohl have created is absolutely stunning and if the first two didn’t get me on board, then this one most certainly did. If you’re not a fan of this series, but still liked the first book, than try to finish the second one (Have you noticed that a second book is like a curse in a series? 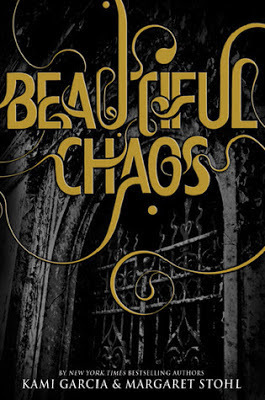 I don’t know what’s up with that), because Beautiful Chaos was so, so good. It wasn't perfect, but it was definitely a far cry from Beautiful Darkness and I couldn't be happier. PS. The cover is a major let down though. The other three are so much better.. I enjoyed the first book but I read so may mixed reviews of the second one that I never really got inspired to pick it up. I'm glad to know that if I make my way through it, this book will make it worth my while:) I can't wait to see Beautiful Creatures on the big screen, it's so exciting that all these YA books are finally making their way into movie form! I have only read the first, but I enjoyed it, and want to know what happens. Yay! I'm looking forward to hearing what your thoughts are. I haven't really looked up any reviews for this series other than a few vlog post so it'd be interesting to see what others think:) Hope you enjoy BC!